I’m back on the “Steinbeck Trail.” The subject of his Journal of a Novel entry that I’ll be commenting on just happens to provide the perfect introduction to some news that I wanted to share with you. It’s the kind of coincidence that just gives one chills, as though all the stars are aligned in one’s favor and the Universe is nodding with approval. Thank you, Mr. Steinbeck, for such a lovely segue. Readers of this blog will recall that some months ago I posted about Blackwing pencils. They came up in a story I read about the connection between writing in longhand and brain activity. The story mentioned Blackwing pencils as being premier writing instruments. The Blackwing pencil was introduced in the 1930s by Eberhard Faber and was the pencil of choice for Oscar, Grammy, and Pulitzer Prize winners throughout the 20th century. After it was discontinued in the 1990s, fans began paying as much as $40 per pencil to acquire unused stock. Curiosity about exactly who used Blackwing pencils led me to John Steinbeck, which led me to his Journal of a Novel. But wait, there’s more. These near-mythical writing instruments seized my imagination. Was it an accident that award-winning creative people used Blackwing pencils, or were the pencils themselves inbued with magical properties? I explored this notion in a short story, entitled Blackwing. 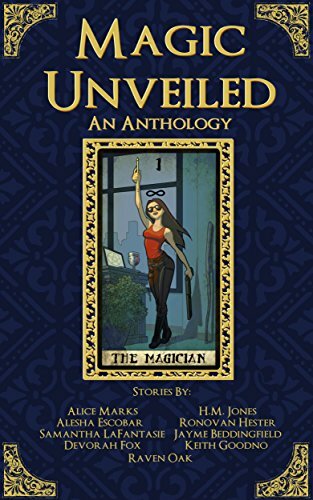 Today I am delighted to tell you that you’ll soon be able to read my story, Blackwing, in a forthcoming anthology of magical realism stories called Magic Unveiled. The collection will launch October 13, 2016, but you can preorder it now. That my news about the anthology’s debut dovetails with my planned post about John Steinbeck’s Blackwing-pencil discovery seems in itself quite magical, doesn’t it?